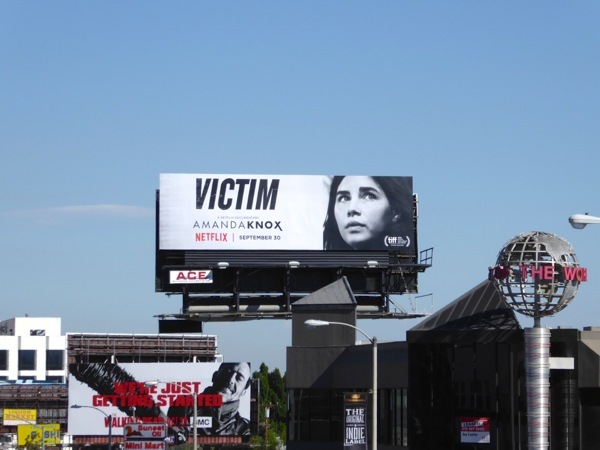 Netflix has quickly become a destination for thought-provoking documentaries, be it the Emmy-winning Making of a Murder TV series, or Oscar-nominated films like The Square, Virunga and What Happened, Miss Simone? 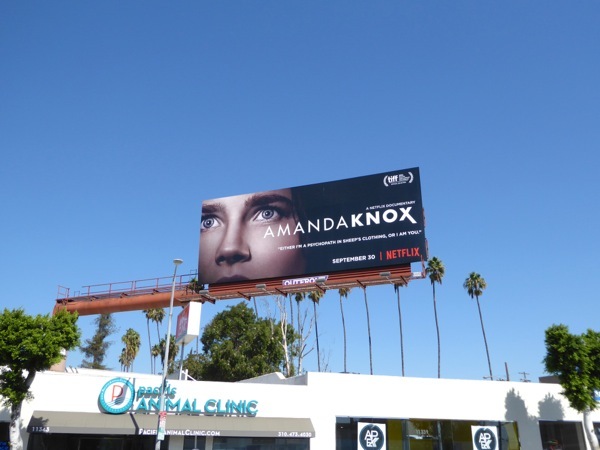 Now one of it's latest offerings about controversial figure Amanda Knox gets some clever support in the skies around L.A., with billboards on opposite sides of the Sunset Strip wondering if she is a 'Monster' or a 'Victim' for her participation in the murder of British student Meredith Kercher in Perugia, Italy in November 2007. 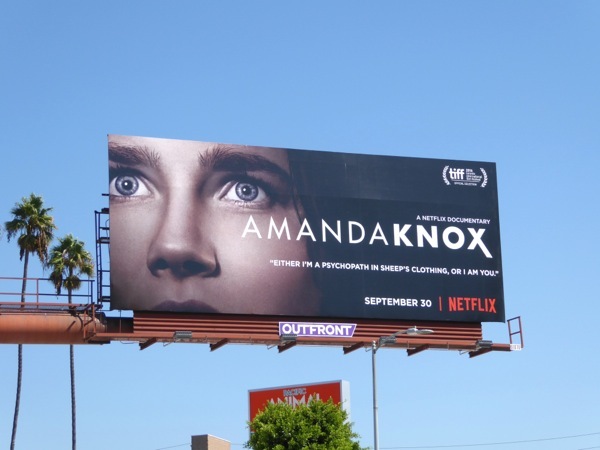 The then 20-year-old American exchange student Amanda Knox and her Italian boyfriend, Raffaele Sollecito, were charged for the murder of the student who shared her apartment and served almost four years before being freed in 2011, and eventually exonerated in 2015 by the Supreme Court of Italy. 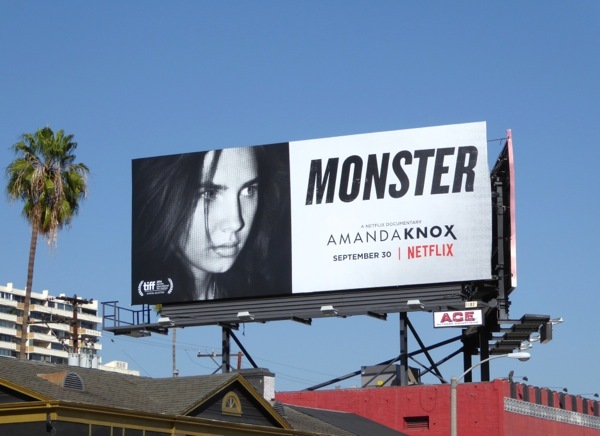 The colour billboard ad creative, with Amanda Knox almost looking like a deer caught in the headlights, was snapped along Santa Monica Boulevard in West L.A. on September 29, 2016. 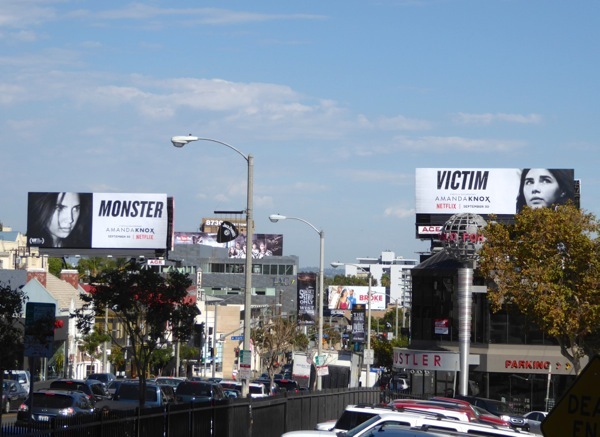 Meanwhile the black and white 'Monster' and 'Victim' billboards were photographed above West Hollywood's Sunset Strip later the same day and they make for an eye-catching visual stunt. What's your opinion? 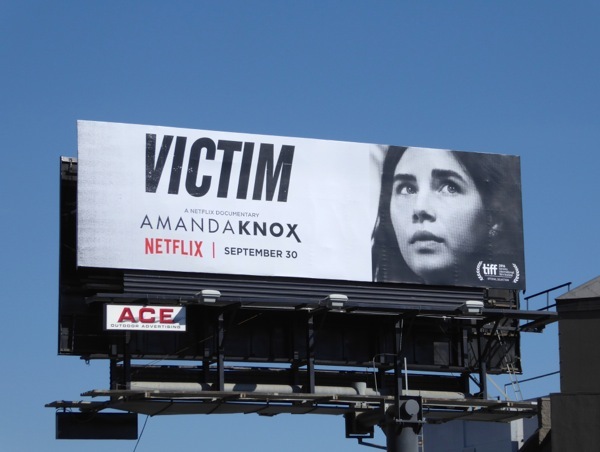 Do you think Amanda Knox is innocent, or as guilty as sin? 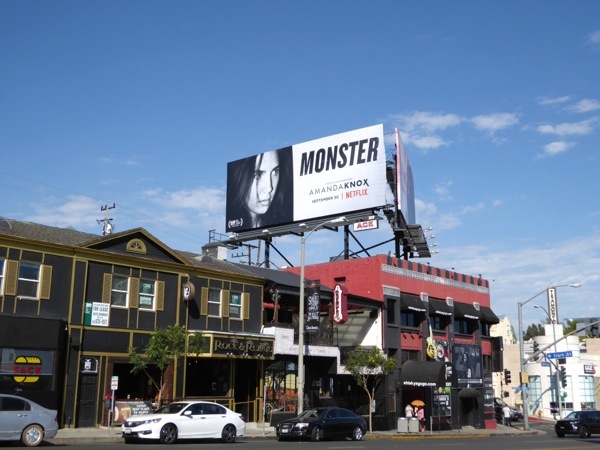 Monster, victim, or something in between. 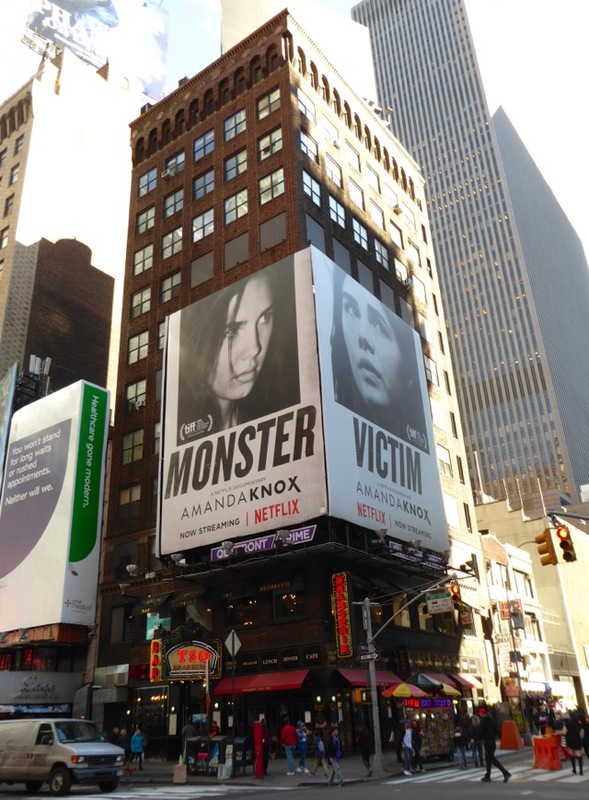 UPDATED: Not only is the Amanda Knox documentary getting exposure in the skies of L.A., but these 'Monster/Victim' billboards were also spied along 7th Avenue at W 48th St in New York City on November 11, 2016. 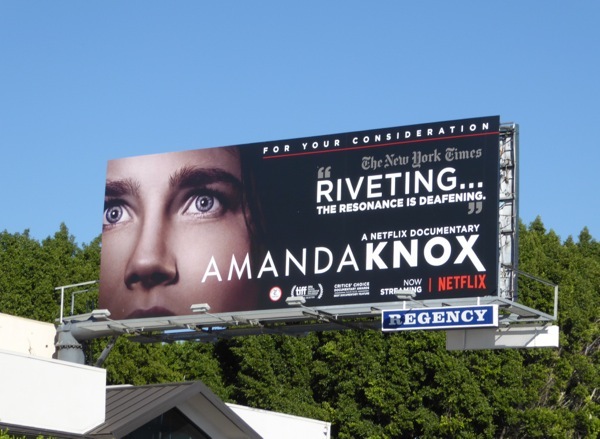 In addition, as awards season approaches this 'For your consideration' billboard was also spied along West Hollywood's Sunset Boulevard on November 14, 2016.